Filmed at the beautiful seaside on Cape Cod, these beginner-friendly exercises can be practiced by anyone, with no experience necessary. This invigorating qigong style is moderately paced, with simple arm and leg movements that are accessible to people of all ages and abilities. Unlike most qigong, which requires a lot of concentration, this routine is so easy that you can practice it while talking with friends or watching television. 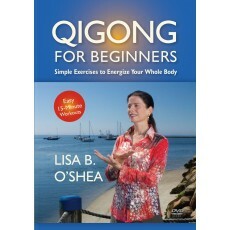 This is a great way to begin your qigong journey. Take charge of your health. Develop a deep sense of balance in body, mind, and spirit. The Qigong on this video can be practiced by people of all ages, and requires no prior experience or special abilities. A little practice each day can result in a profound improvement in your health. With the DVD format, you can skip to any section of the video you choose. There are chapter buttons for each section, and also many within each section.